Destiny 2: Forsaken moves the franchise forward by taking a step back, but the epic story and new content give players plenty to do, and once again sets itself up for years of intense firefights. Last fall, I famously — or infamously, based on the comments — gave Bungie’s Destiny 2 five stars out of five. At launch, the compelling, deeply engaging story, and myriad of changes that Bungie made to the franchise elevated it to new heights. But soon after wrapping up the story and after a few weeks of end-game content, the cracks started to show, and if I had a chance, I would have definitely lowered the score to something more realistic. Now, in the second year of the second core Destiny game, Bungie has released Destiny 2: Forsaken, and they kicked it off by killing a major character, an event that reverberates throughout the game and the franchise (in every way) moving forward. The question is, will my verdict (and by extension, score) hold up down the line? Destiny 2: Forsaken opens with Cayde-6 being killed after a mission to stop a prison break at the Prison of Elders. Unfortunately, this was all spoiled by Bungie and Activision before hand, but it doesn’t make the sting of the loss any easier to swallow. My main has been a Hunter from day one, so Cayde was my leader — my guy. His voice, performed by the always brilliant Nathan Fillion, has been my guide for over four years, and I was engaged enough in this franchise to feel rage and the drive for revenge in the wake of his murder. The culprit, Uldren Sov, apparently has a plan to find his presumed dead sister, the Awakened queen, Mara Sov, and Cayde’s death is key. Mara Sov was seemingly lost when Oryx invaded the galaxy in the original Destiny, and the Reef has been in chaos ever since. Uldren Sov orchestrates the prison break using super powered Scorn, a new race (well, they are Fallen imbued with powerful dark ether energy), and the Scorn are led by eight Barons that the player must hunt down and kill on the path of vengeance. This epic quest is the most “game-y” adventure that Destiny has ever attempted, and the story content, which runs about nine hours, is very straight forward. Hunt and kill the barons, find Uldren Sov, end him, rest easy knowing that you avenged Cayde-6. Then spend months doing raids and strikes until the next piece of DLC drops. Destiny 2: Forsaken opens up a new map, the aptly named Tangled Shore, which is located in the Reef. Most of the new content, missions, and adventures unfold here. There is a new character, The Spider, who rules the lawless land, and serves as a quest giver. The Spider also awards bounties for the player to partake in; hunting down named enemies throughout the galaxy. Bounties actually drive most of the content in Destiny 2’s second year. 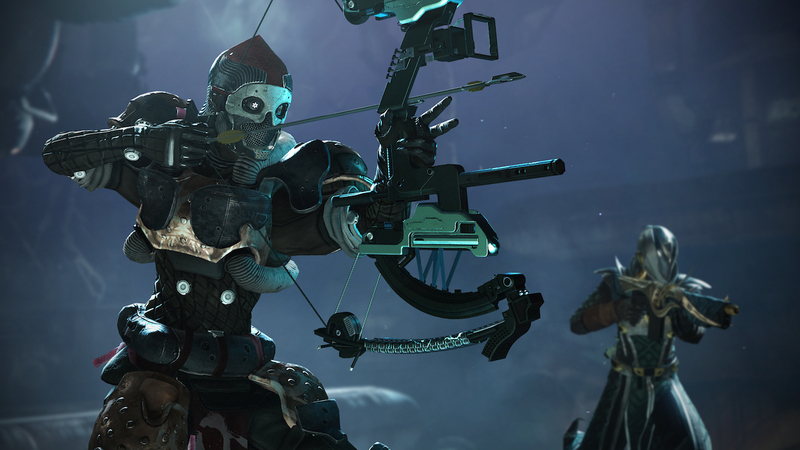 Almost every major character offers players a series of daily and weekly bounties, and completing them earns you engrams, glitter, and the various faction points, like Vanguard, Clan, and Crucible points. It makes for an incredibly slow grind, which slows down the progress of just about everything in Destiny 2: Forsaken. Unlike last year, it’s impossible to max out everything in a few weeks, meaning you’ll have to put in some effort to unlock everything. In many ways, Destiny 2: Forsaken pushes the franchise back closer to the original Destiny in terms of its design. Weapons have been overhauled, and there is less emphasis on compartmentalization and more on the freedom to use what weapon you like best. Power weapons feel this change the most, as sniper rifles and shotguns have been moved to Energy, and can be equipped in either the Kinetic or Energy slots. Power weapons are back to grenade and rocket launchers, weapons that live up to their name. A new weapon, the bow, is introduced, and it quickly became one of my favorites. It’s pretty powerful, meant to compensate for the fact that you get one shot per pull, but the targeting is smooth, and pulling off precision kills and headshots is much easier than I expected. Collecting engrams as a reward now has more importance, as they aren’t overpowered from the start, so the drive to level 50/power level 500+ is a bit of a crawl, and burning unwanted weapons to upgrade the ones you like has taken a new/old turn. The material cost to upgrade costs more than the old weapon and some glimmer. Masterwork cores are needed for most legendary or higher upgrades, as are certain other materials, like the various planet-specific resources, which leads to some annoying farming. Most of these materials can be purchased from The Spider, and his prices change daily, but even so, the cost is sometimes prohibitive when you are pouring all your efforts into upgrading your favorite gun. Possibly the biggest addition to the Destiny franchise is the new Gambit mode. Gambit is a hybrid PvE/PvP game where two teams of four battle to kill enemies and secure motes. These motes are then banked in a centrally located tank, and once 75 motes are collected, a powerful Primeval enemy is unleashed. The team then has to work fast to kill the Primeval before the other team can kill theirs. Complicating all of this is a portal that allows rival teams to send over an invader, who can attack your team while you’re busy or distracted. Killing a rival player actually heals the Primeval, which is a strategic component that teams use as the round draws to a close. Gambit matches are pure chaos, and can be extremely fun when you have a team of four people focusing on a victory. It goes south quickly when every team member is out for themselves in order to secure a bounty, or simply because they aren’t well-versed in teamwork. 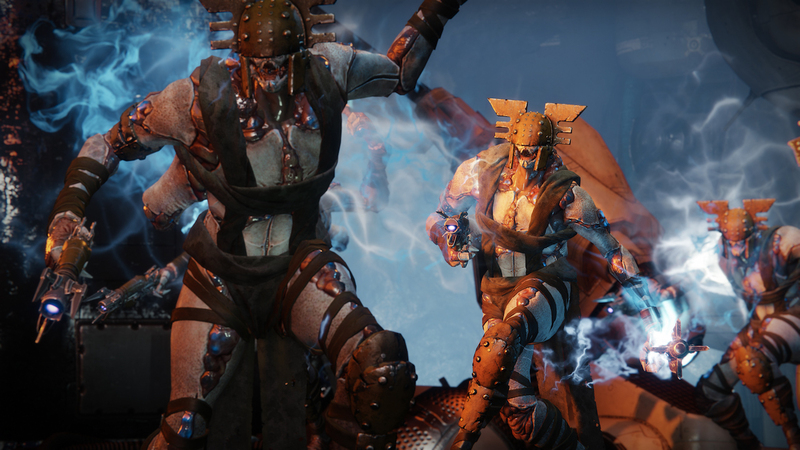 Gambit has its own leveling system, like Crucible, and it exists outside of the story campaign, serving as another fun distraction for players needing a break from the various Strikes, Raids, or the Story. 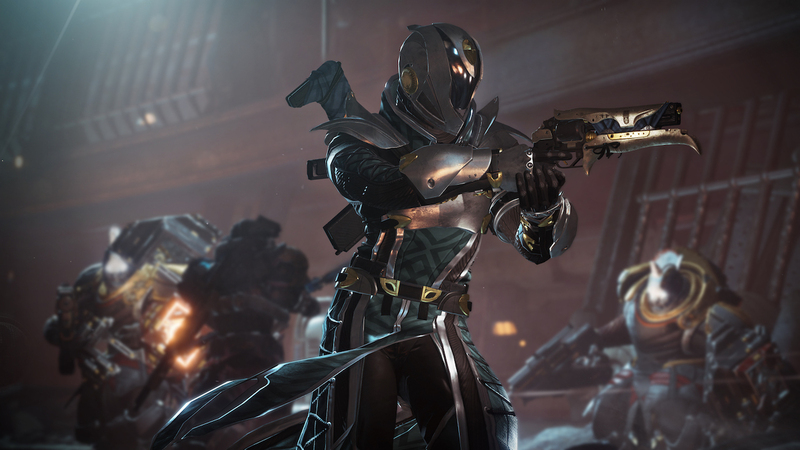 The last major addition to Destiny 2: Forsaken is in the Triumphs progression system. Players get triumph points for seemingly all they have done in the franchise to date. This is yet another score to shoot for, and helps focus the player on what needs to be done for completion. Or as much completion as you can attain. One triumph awards players for buying a special edition version of the original Destiny 2, and if you didn’t buy that version, you’re out of luck. No 100% completion for you. Triumphs and the new Collection records help keep track of your journey as a whole, which is nice. Players can even buy certain pieces of earned armor and weapons from the collection screen, which de-emphasizes the need to dismantle unneeded items. The first new Raid of Destiny 2: Forsaken went live a few days ago, and there are a few new Strikes on the Tangled Shore to take on with your fire team. Strikes have once again been pulled out of a playlist and can be selected from each planet’s map. This is a nice step back when certain bounties call for the player to take on a certain race of boss in a strike. There is still a Strikes Playlist, as well as heroic strikes and the nightfall returns, but the power level requirements make it something you truly have to work for to even play. This all helps give Destiny 2: Forsaken some much needed post-story objectives, and will hopefully better bridge the main game to the first DLC drop in December. That being said, I’m much more comfortable in my review score this year than I was last year, as after a solid two weeks of playing, I can see where the game is and where it’s going, and like most dedicated Guardians, I see myself playing multiple days each week going forward. Destiny 2: Forsaken made the interesting decision to move forward by actually taking a step back. 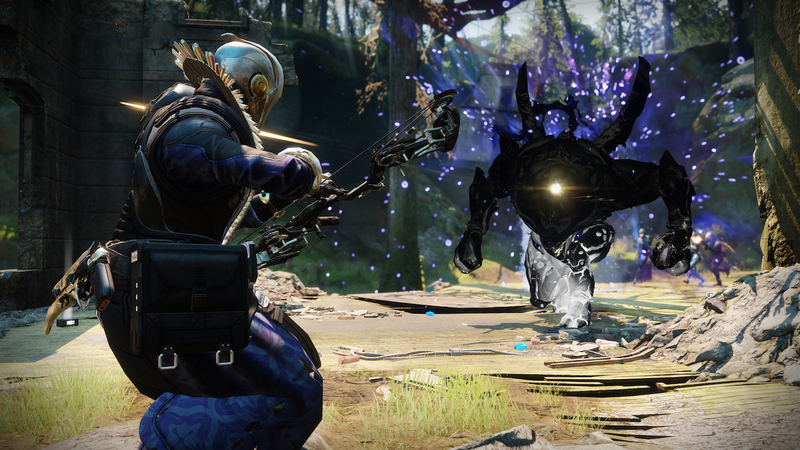 By bringing back many of the processes from the original game, Forsaken — and the franchise as a whole — is trying to make right by the players who have complained, and yet still create something new and exciting. The story of Cayde-6’s death and the justice brought to his murderer show that Bungie can tell a cinematic story that is engaging and deep, and the grind needed to grow your Guardians will keep players coming back each week to complete bounties, join timed events, and play in chaotic Crucible and Gambit matches. It seems like each time players think they have Destiny figured out, Bungie makes some notable changes. I’m okay with that. This franchise soldiers on with each new release, be it a DLC, expansion, or numbered sequel, and the millions of players worldwide have made it one of the best massive multiplayer games on the market. Destiny 2: Forsaken pushes the franchise forward once again, and the universe gets a little bigger each time. This review is based on a Playstation 4 version of the game. A copy was provided to us by Activision.